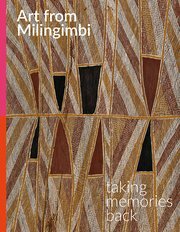 Jimmy Lipundja was at the forefront of the dynamic art movement that emerged at the small island community of Milingimbi in Arnhem Land from the early 1950s. 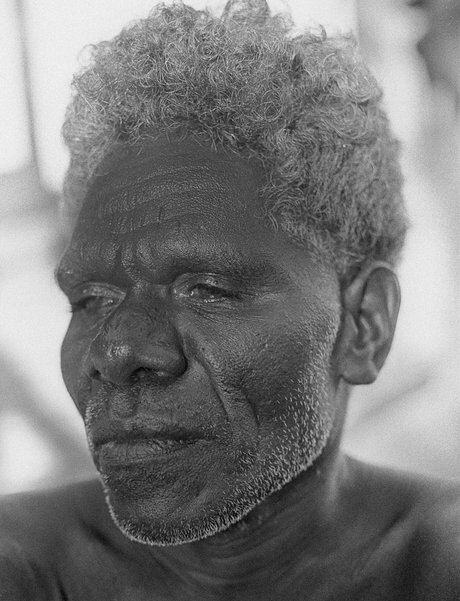 He was a younger brother of Djäwa and therefore shared connections to the Gupapuyngu Daygurrgurr estate of Djiliwirri at Buckingham Bay on the mainland to the east. Of most importance at this location is the Yirritja honey, known as niwuda, which offered a constant source of inspiration to Lipundja throughout his career. Widely recognised for his distinct sculptures, Lipundja created impressive figures in matte black ochre featuring the vivid diamond pattern for niwuda on their chests and thighs. With solid figures and triangular faces, he often enhanced their commanding presence with the addition of human hair to their heads and pointy beards. Murayana (spirit) looking for guku (honey) c1950s was recently identified as being by Lipundja and can be seen as a precursor to these imposing figures. This diminutive work in flattened form is expertly carved from a single piece of timber. Its elongated arms, straightened torso and graphic facial features provide an image of stylised refinement. The controlled symmetry of the work is broken only by slight aberrations – one ear higher than the other, one arm longer and one hand featuring an additional yellow stroke to give the indication of thumb and fingers. The facial features of the Murayana are rendered in Lipundja’s unique linear style, with bold bands of yellow and red outlined in vivid white. Such is the efficiency of this line work that those lines defining the lower portion of the nose also form the mouth, while those that separate the face from the hair give an indication of the presence of a headband, and a single yellow band on the legs forms the knees. The segmented use of dramatic black on the cheeks, chin, ears and most effectively the eyes enhances the directness, presence and intrigue of this figure. The regulated design for niwuda adorns the figure. Its repeated diamond form is synonymous with the honeycomb from which this prized bush food is sourced. Particular colours are used to indicate the cells in different stages of development from empty to full, and the dotted infill refers to the presence of bees and their larvae. In looking for honey this figure is swatting bees and placing the design on his chest. The design shows both the sting and swat marks. This adornment on the chest and thighs of the figure echoes the positioning used when it is painted on the body for ceremony. It is also employed on various Gupapuyngu Daygurrgurr sculptures, including tightly twined bathi (baskets) used for collecting honey. The design for niwuda represents the essence of what it means to be a Gupapuyngu Daygurrgurr person. Lipundja offered multiple iterations of niwuda throughout his career, with subtle variations highlighting varying aspects of this honey. Niwuda (Yirritja honey) – empty honeycomb in a large tree c1950s employs the base structure of the diamond design, its empty cells showing the absence of honey. Niwuda (Yirritja honey) – a great honeycomb c1950s depicts multiple trees, mostly full of honey, with the central horizontal bar also indicating a particular division of land as a form of mapping country. These works are all quite geometric in form, with the repeating patterns covering the entirety of the bark. In slightly later works of this subject Lipundja offered further complexity, dividing the composition into three and including figurative elements, as seen in Niwuda (Yirritja honey) c1960. Rain in the trees c1950s is distinct within Lipundja’s oeuvre, referring to seasonal change and the atmospherics of country. The work references the season of midawarr, just after the wet, when bush foods are ripe, animals are fat and seafood is plentiful. At this time the wind blows from the east and it is the season for yams. It is a painting for Lipundja’s mother’s clan and provides an interesting comparison with the work of Binyinyuwuy that is similarly titled, from c1959. Both offer an evocative image of rain replenishing country; Binyinyuwuy’s shows the dramatic deluge and electrical storms that come with the wet, while Lipundja’s depicts the following season, when lighter rains fall and the regenerative powers of seasonal change are evident.